We live in a world, according to N. Katherine Hayles, where new languages are constantly emerging, proliferating, and fading into obsolescence. These are languages of our own making: the programming languages written in code for the intelligent machines we call computers. Hayles’s latest exploration provides an exciting new way of understanding the relations between code and language and considers how their interactions have affected creative, technological, and artistic practices. 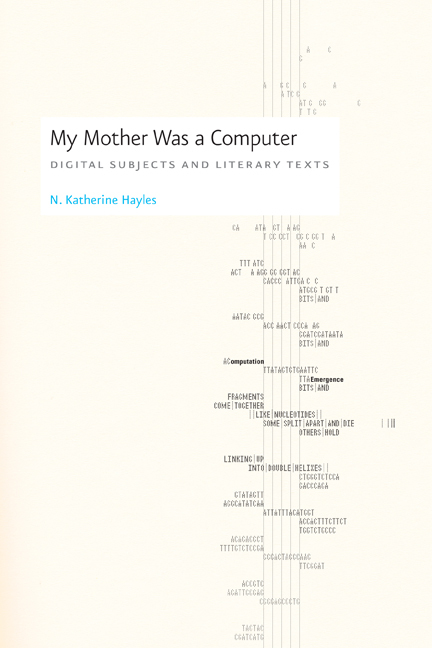 My Mother Was a Computer explores how the impact of code on everyday life has become comparable to that of speech and writing: language and code have grown more entangled, the lines that once separated humans from machines, analog from digital, and old technologies from new ones have become blurred. My Mother Was a Computer gives us the tools necessary to make sense of these complex relationships. Hayles argues that we live in an age of intermediation that challenges our ideas about language, subjectivity, literary objects, and textuality. This process of intermediation takes place where digital media interact with cultural practices associated with older media, and here Hayles sharply portrays such interactions: how code differs from speech; how electronic text differs from print; the effects of digital media on the idea of the self; the effects of digitality on printed books; our conceptions of computers as living beings; the possibility that human consciousness itself might be computational; and the subjective cosmology wherein humans see the universe through the lens of their own digital age. We are the children of computers in more than one sense, and no critic has done more than N. Katherine Hayles to explain how these technologies define us and our culture. Heady and provocative, My Mother Was a Computer will be judged as her best work yet. 7. (Un)masking the Agent: Stanislaw Lem’s "The Mask"
"Hayles has once again produced a compelling synthesis of highly complex, widely scattered discourses. . . . The achievement is formidable. . . . She is the great American reader." "Hayles’s work here seems essential: she not only reviews how we got to this stage in our relationship with technology, she also maps a conceptual survival guide for going forward. With complex theoretical concepts such as clustering, the Regime of Computation, and intermediation, Hayles moves us further along the spectrum through which we can constructively understand the terms of posthuman existence without feeling damned to technological extermination by doing so."